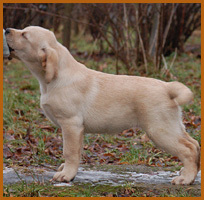 Labrador’s kennel CHILD OF SUNRISE is in a very picturesque place not far from Kiev. Near us is a beautiful forest and lakes, where our dogs are walking. I’ve dreamed of a dog since childhood, and it had to be a German Shepherd. But probably like many childrens, I realized my dream not in my childhood. Long time ago in the 1996 years, on the first year of the institute, parental resistance was overcome ;-) and we had a black beast spaniel - Linda. To say that I was happy, do not say anything !! But I still dreamed of a German Shepherd. Linda has lived with us for a long and happily life. But unfortunately the life of dogs is not as long as human and at age 13 years Linda was gone. And then the "capture of the fortress" began again, but this time not of the parents, but of the husband. He was categorically against the dog (Linda lived with her parents after the marriage, so the husband was not used to the dog in the apartment). A long year of persuasion and requests, almost no results. But I firmly knew that sooner or later I will have a dog. Of course, I did not stop dreaming about a sheepdog (of course, I was not familiar with Labrador breed at that time), but more and more stared at Labrador puppies. In the end, the fortress was again taken by storm :-). 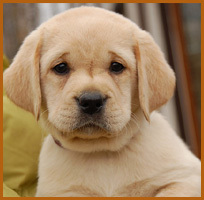 Thank God that on our way a beautiful woman from the kennel KATTYVAL, who had at that time two 3 month old Labrador puppies, met. Yes, it’s not her puppies, but I’m glad that it was with her that we ran nose to nose. Katya KATTYVAL, what is her excerpt from the endless questions of doubts and experiences of "crazy mothers puppies". And so we went to her kennel that evening. According to the photo on the site, it was decided to take Milady, because of her sad eyes. On the photo Miles 2,5 months. As they say, kui iron while hot, seeing that the husband is almost killed, we run away picking up the puppy, so he did not change his mind ;-). Did he know then how he would love this bright miracle. 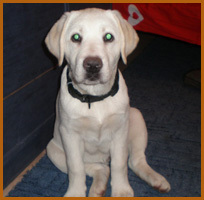 And now ask me if I want a sheepdog, HA, LABRADOR BECOMES AN INTEGRAL PART OF MY LIFE !!! That’s how a pale miracle appeared in our life. A little bit about Milina’s origin. Our dad is known in the exhibition circles Biggas Name Game. Owner Oksana Orel cattery CAMESWON. Our mother Nizza Color Sayt. And as they say, labradors have the property to accumulate, or many Labradors do not exist. Of course, like all lovers of this breed, we did not stop there. Life spun, wrapped in a new round. Exhibitions, new acquaintances, trips to nature, summer evenings on the lake, the river, anywhere, just water, even a change of place of residence - all this was presented to us by our Milyusha. In secret from her husband, she began to dream about the second dog and her kennel. Slowly and confidently, I went to my dream. 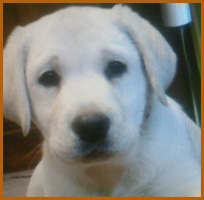 Already fully understanding what type of Labrador I like, I began to watch one dog "DREAM". Yes, yes, it is a dream. In principle, it is so called American Dream for Lab’SPb (American Dream). A lot of people helped me to fulfill my dream, and in our house there was a red-haired miracle, a red-headed beast, but madly desired and beloved by LAB’SPB RIKKI CHILD OF SUNRISE. Olga Yegoria, the owner of the kennel LAB’SPB, thank you for the rainbow welcome, for the opportunity to choose our miracle, and for the trust. I hope we will justify it. A bit about Ricon’s origin. Our dad is a famous American manufacturer Gateway’s Nothin ’But Trouble. Our mother American Dream for Lab’SPb, the great producer and daughter of the famous American manufacturer DICKENDALL DAVARON GABLE.